I'll admit it. I take books for granted. I surround myself with them and they bring me an easy comfort. Bought books. Library books. Books passed hand-to-hand by me and my book-loving friends. Lemony Snicket said, "It is likely I will die next to a pile of things that I was meaning to read." That's me. And more than likely, it is you too. A few years ago, I heard about a Chicago area non-profit called Bernie's Book Bank that was working to fill a critical gap -- bringing children's books to the 61% of families who do not have a single children's book in their homes. I organized a used-book drive at my elementary school. My kids and I sorted through our bins of outgrown books and donated boxes full. Since then, my family and I have made donating and volunteering at Bernie's Book Bank a regular part of our life. Although I've volunteered many times, I wondered what Bernie's Book Bank was like from an insider's point of view. Nancy Hopma was kind enough to answer a few of my questions. Tell us a little about your role at Bernie's Book Bank. What does a typical week look like for you? My role at Bernie's Book Bank is Office Coordinator. It is an umbrella that covers many things. Mainly, I am responsible for the volunteers. I manage the scheduling of all volunteer sessions. I am also constantly creating and maintaining relationships with our very valuable volunteer work force. This means outreach events and a lot of correspondence. I write many thank you letters and notes. This last part is especially rewarding. Who wouldn't want to spend a big chunk of their day expressing gratitude?! I also handle many organizational duties in connection with our generous financial donors. We have great CRM (customer resource management) software that we use to keep track of everything we do and everyone who helps us do it and I manage this system to a degree. I am also part of a team that organizes and produces our special fundraising events throughout the year, including our two Book Lovers Lunches and our annual Birdies & Books Golf Outing. A typical day for me means a lot of communication! I receive many emails and phone calls from people who are interested in helping us out. We are very grateful for this! We could not do what we do without our volunteers. I spend a lot of time scheduling events here at our processing center. I am also constantly interacting with the volunteers who come through the our doors every day. I greet them and chat with them before I hand them off to our very capable Processing Center staff. One thing I love about Bernie's Book Bank is hearing how people first found out about the organization. For me, it was scheduling a school book drive. How did you first connect with Bernie's Book Bank? I first connected with Bernie's Book Bank when we brought my daughter's Daisy troop here. One of the other leaders had heard of this place through a friend so we brought the girls to check it out. The girls not only LOVED it, but they got it. They were able to connect with the mission on a personal level. I was instantly invested. I kept thinking to myself, wouldn't it be great to work here? How lucky are these people? Who knew I would end up being one of them. This post is called Reaching Readers and highlights ways to connect books and kids. 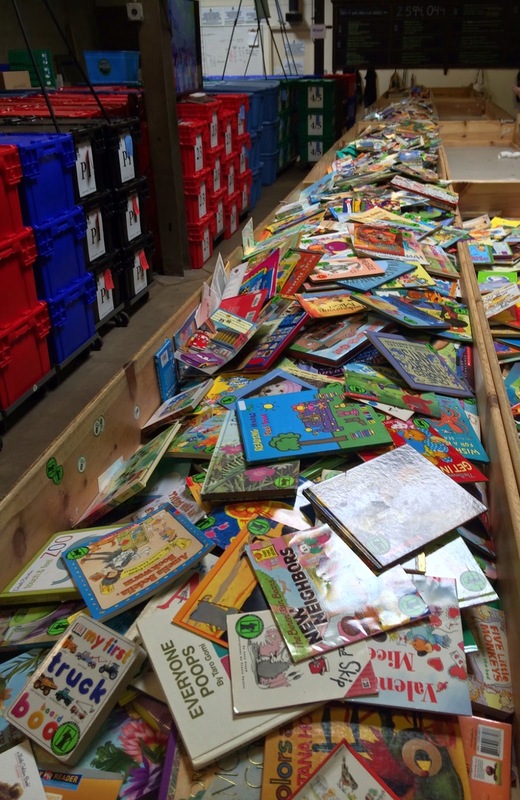 Bernie's Book Bank does this in a literal way by giving donated books to at-risk young readers. Can you tell us about the size and scope of this need? There is an estimated 400,000 children who fit the criteria to receive books in the Chicagoland area alone. We are working very hard to reach all of them and eventually expand to other metropolitan areas around the country. I am proud to say that we are currently serving about 100,000 of these children and, with continued support, we are right on track to keep growing so that we can serve all of them. I've seen all kinds of books in your processing center -- family donations, books that have been weeded from school library shelves, publisher donations, ARCs, etc. How can our readers support the mission? The three most important resources that people can give to us are books, time, and money. The books that children outgrow or no longer wish to keep can find an important new home through us. We firmly believe that books can provide a better life for the children we serve. Accomplishing our mission is impossible without the help and dedication of many. Our volunteers are our work force and we could not do what we do without them. We accept volunteers of ALL ages and ALL abilities. The impact of financial donations are immediate. They allow us to continue to ensure that our program will be sustainable for the children that we will serve in the future. Currently, every $100 we receive allows us to serve 21 children with 12 quality books per year. It's thrilling to see so many great children's books in the sorting tables. But I have a soft spot for the copies of Harry Potter as I sticker them and send them on their way. Any special books that make you extra happy as they come through the processing center? The list is long and the Harry Potter books are part of it. Some other special titles are Pretzel by Margret Rey, The Witch of Blackbird Pond by Elizabeth George Speare, all of the George and Martha books, and anything by Richard Scarry. A huge thank you to Nancy for taking the time to talk to me! Check out this video on the Bernie' Book Bank website. How awesome!! I didn't know about this! Great article on a very cool outreach program! Way to go with pitching in, too!